﻿Published by Sareth Ney on Nov. 16, 2017 at 5:49 p.m. 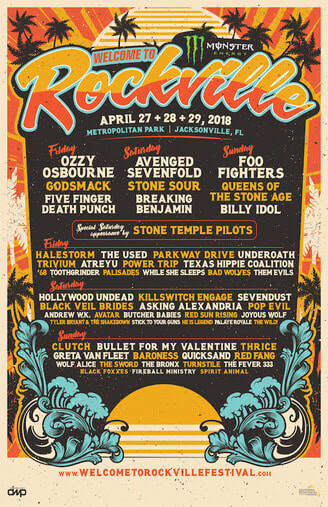 Updated on Nov. 16, 2017 at 7:55 p.m.
JACKSONVILLE, Fla. – Stone Temple Pilots, Toothgrinder, He Is Legend and Wolf Alice were added to the Monster Energy Welcome To Rockville lineup, on Nov. 15. The festival will expand to three days, April 27 through April 29, for 2018. It celebrates eight years and taking place at Metropolitan Park. On April 27, the lineup consists of: Ozzy Osbourne, Godsmack, Halestorm, The Used, Parkway Drive, Underoath, Trivium, Atreyu, Power Trip, Texas Hippie Coalition, ’68, Palisades, While She Sleeps, Bad Wolves, Them Evils and Toothgrinder. Avenged Sevenfold, Stone Sour, Breaking Benjamin, Hollywood Undead, Killswitch Engage, Black Veil Brides, Asking Alexandria, Sevendust, Pop Evil, Andrew W.K., Avatar, Butcher Babies, Red Sun Rising, Joyous Wolf, Tyler Bryant & The Shakedown, Stick To Your Guns, Palaye Royale, The Wild, Stone Temple Pilots and He Is Legend will be performing on April 28. Foo Fighters, Queens of the Stone Age, Billy Idol, Clutch, Bullet For My Valentine, Thrice, Greta Van Fleet, Baroness, Quicksand, Red Fang, The Sword, The Bronx, Turnstile, The Fever, Black Foxxes, Fireball Ministry, Spirit Animal and Wolf Alice are on the bill for April 29. Sponsors of Monster Energy Welcome To Rockville are Monster Energy, The Music Experience, F.Y.E., Zippo and more will be announced. Three day weekend general admission tickets are starting at $129.50 plus fees, three day weekend very important person (VIP) start at $365 plus fees, single day general admission begin at $75 each plus fees and single day VIP begins at $155 plus fees. There will be discount tickets for active military via GovX. Hotel and camping options are also available to purchase. Car and RV camping spots will be located at Tailgaters parking. It includes four nights in a secured parking lot, indoor restrooms, shower trailers, full restaurant and general store. Discounted hotel packages are available through Curadora. Experiences include: Monster Energy Experience (featuring Monster Energy tastings and signing with select Rockville artists), The Music Experience (an interactive exhibit and music instrument retailer), F.Y.E. Fan Experience (purchase your favorite album and get it signed by select Rockville artists), Zippo, Take Me Home (a nonprofit animal rescue organization) and others. Monster Energy Welcome To Rockville “Grub” includes: Indochine, Mojo’s BBQ, TacoLu, Angry Bird Grill, Ben’s Burrito Bowl, Brucci’s, Catullo Brothers, Cely’s Filipino Food, Classic Home Cookin’, Funnel Cake Fantasy, Girls Gone Green Nacho bar, Grumpy’s Homemade Ice Cream, GuanaBana Ice Pops, Hebros Bacon Restaurant, Island Noodles, Knuckle Sandwiches, Mac Attack, Mount Olympus Greek, Nomi’s Island Girl Foods, Ollie’s Tots, Pele’s Wood Fired Pizza, Pie Baby, Rock N’ Roll Arepas and What’s The Catch Fish Tacos. Those 21 and over can attend the Caduceus Cellars & Merkin Vineyards Wine Garden and Heavy Tiki Bar featuring cocktails and shade. Local craft beers are available. VIP tickets grant access through the VIP entrance to the venue, lounge area (dedicated bar, beverage, food service, viewing of main stages, seated area with shade for dining, private restroom facilities) and guest laminate. Monster Energy Welcome To Rockville is produced by Danny Wimmer Presents (DWP). Other festivals by DWP are: Rock On The Range, Monster Energy Aftershock, Louder Than Life, Monster Energy Fort Rock, Monster Energy Carolina Rebellion, Chicago Open Air, Bourbon & Beyond, Monster Energy Rock Allegiance, Northern Invasion and more. Monster Energy Welcome To Rockville starts the World’s Loudest Month festival series. Danny Wimmer Presents was started by Danny Wimmer. Since 1993, Wimmer produced concerts and festivals of all sizes. In 2011—he created Danny Wimmer Presents and features A-list talent, local cuisine and culture.